Israel Air Force hits observation post belonging to Hamas in northern Gaza in retaliation for earlier rocket fire directed at Israel. The Israel Air Force attacked an observation post belonging to Hamas in northern Gaza overnight Thursday, the IDF Spokesperson's Unit said. According to the statement, the air strike was in retaliation for earlier rocket fire directed at Israel. 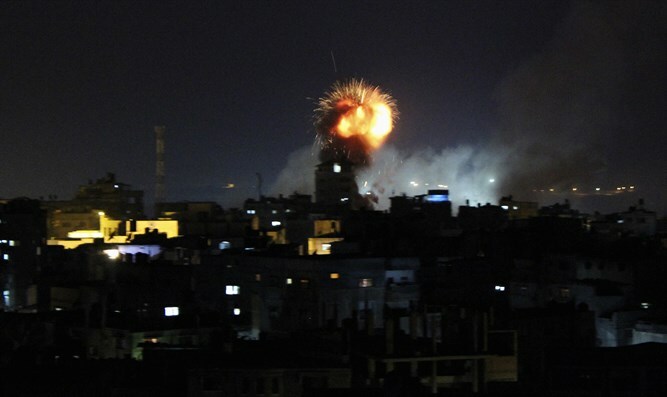 At around 11:30 p.m. on Thursday evening, terrorists from Gaza fired a rocket toward Israeli territory. The rocket exploded near the border fence. There were no reports of physical injuries or damages. No siren was sounded in Gaza Belt communities. Earlier on Thursday, four armed Arab terrorists were captured after they crossed into Israel from Hamas-ruled Gaza. Israeli security personnel nabbed the four terrorists after they managed to penetrate the security fence along the Israel-Gaza border. After the four terrorists were captured, Israeli forces found the four were carrying two knives and a grenade. The suspects have been transferred for interrogation. On Monday night, the “Red Alert” incoming rocket siren was sounded in the Shaar Hanegev and Sdot Negev Regional Councils of southern Israel. While initial reports indicated that a rocket fired from Gaza exploded in an open area in southern Israel, the IDF later said it was unable to determine whether any rockets had been fired towards Israeli territory. Earlier this month, a rocket was fired from Gaza towards Israeli territory. The rocket exploded inside Gaza and therefore the incoming rocket sirens were not activated. In late December and early January, there was an increase in rocket fire from Gaza, including one day in which there were three rocket attacks.